Join us for a half day tour to the Techatticup Mine near Nelson, Nevada. After you are picked up at your Las Vegas Hotel, you will head to the Hoover Dam for a quick view of the Colorado River and photo opportunity. Next you are off to Eldorado Canyon to explore the Techatticup Mine. You will be briefed by one of their expert guides on the history of the mine and Eldorado Canyon in their "General Store." The mine entrance is just a short walk away and there you are transported back in time when mining was a way of life for Southern Nevada. The tour inside the mine is approximately an hour. Afterwards, you will have time to shop and take pictures of the surrounding area, which has also been used for a number of famous movies! Before heading back to Las Vegas, we will take you down to the Nelson Overlook for a gorgeous view of the Colorado River flowing through Eldorado Canyon. Finally it's back to Las Vegas to your hotel to enjoy the remainder of your day. The Eldorado Canyon Mine day tour departs the Las Vegas strip between 6:30am and 7:30am and returns between 11:00am and 12:00pm. 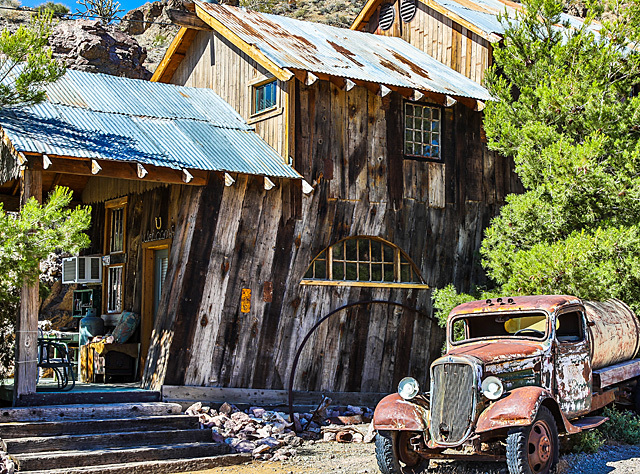 The Eldorado Canyon Mine Day Tour is one of the premier day tours from Las Vegas bringing adventure and rich history. Guests will receive a morning snack and unlimited bottled water.